In early August, Bardog Tavern owner, Aldo Martino, opened a restaurant at the intersection of Cooper and Peabody. 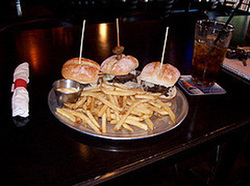 Slider Inn, a restaurant and bar is located at 2117 Peabody. Slider Inn has six beers on tap, a few bottled beers, a red and white house wine, and select liquors. He has already anticipated the needs of the numerous vegetarians in Cooper Young; “We’re going to have a really great veggie burger. That will not be in slider-form- that will be a full-size burger. We’re playing with a few different recipes right now using molasses and black beans, sprouts, and cinnamon,” says DeMartino. The environment will be casual. DeMartino will allow the customers to invent the atmosphere. “I think the environment creates itself. We’re just going to put a comfortable and cozy little place on the corner there. And the environment will be dictated by how the customers create it,” he says. Slider Inn will be 21 and over and permit smoking only after a certain time. “We want to concentrate on an easy going atmosphere. If we do any business we want to involve the neighborhood. We want to have fun while at the same time providing a good community center, ” says DeMartino. Checking out the new Slider Inn in Cooper-Young? about one of the newest eateries in the neighborhood. Read articles about the Slider Inn in other Memphis media... and about Cooper-Young's new 'blue plate' restaurant, also opening in August.